Access Control section contains the electronic parts you need to offer keyless entry to your property. Usually electronic locking systems are used for communal doors on blocks of flats or office blocks. Also we have a range of magnetic locking solutions suitable for internal and external doors. Access control systems can be wired together with your fire alarm system to allow exit in the event of emergency. 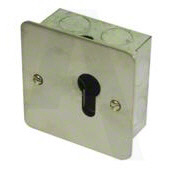 We also sell the suitable locks for these systems, usually used with either the Yale 88 nightlatch or the Union 2332 mortice nightltatch. Range of ERA Smart Home products. Intercoms, Video Door bells and alarms. Delivery Info: free delivery on this item. Electric releases work with nightlatches so that communal entrances can be opened by telephone handsets. Individual keypads to work with access control systems. Available in different sizes, the bigger panels have larger buttons.